One of the things that we haven’t talked about a lot on this blog is how to finish a piece you have been working on. For many of us we will antique the piece and even varnish the piece. But what do you do after that? I’m going to show you an example of what I did with one of my pieces. I know that this seems like the most obvious, and it is. 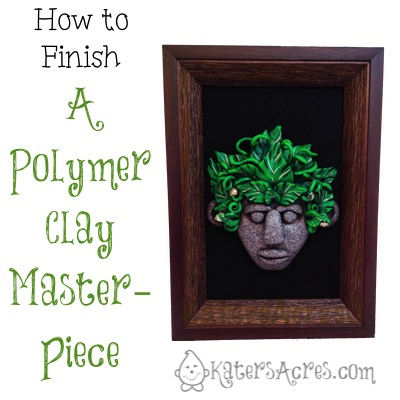 But if you want to frame your polymer clay design, then you must first make a polymer clay piece that is worthy of framing. There are lots of tutorials here on my blog you could have a go at, or you can run a search in Google, or try a project from Pinterest! But make something that looks and seems like “fun” to you and something you would enjoy. You can see the piece that I framed & it’s tutorial here. Deciding how to finish your piece is often the most difficult part. Sometimes pieces look better with an antiqued finish. Some pieces look great with the look of the raw clay. Some pieces it’s far better to seal them with a gloss varnish. The question always becomes … now what? If you’re not making jewelry, then your piece has the ability to do something. Maybe it can sit on a coffee table, hang on a wall, be placed in a doll house … stop … think … what can your piece do? If you’ve decided that your piece should hang on a wall, then give it a little kick! My piece was great, but it’s a Christmas gift for two people I dearly love … so I couldn’t just give them the Menehune … I decided it needed to be in a frame. So now’s the hard part. Take your little creation shopping! That’s right! Pack up your piece and hit the stores. I like to start at TJ Maxx. They have high quality frames at very inexpensive prices. In fact, in the case of this little guy, I found my frame at TJ Maxx and didn’t have to shop anywhere else (even though you know I did because … well … it’s shopping … why not?). As a side note, one of the reasons I take my piece with me is because even if I take dimensions of my piece, I want my frame and my piece to look like they go together. In the case of this framed piece, the Menehune was over 1″ deep. Therefore, my frame needed to be deeper than that (or at least that’s how I wanted it). You could also try your local craft store. Here’s why I DON’T get my frames at a craft store. They are not that interesting. Here where I live they are kind of boring, usually they have a beveled edge, are plastic, or need a paint job. This being said, if you are a craft diva through and through … paint your own frame, decorate it up, go for it! But as for me … I’ll buy the frame and make the centerpiece for it. Finding a frame may take a long time. I still have 2 pieces that aren’t framed … why? I haven’t found the right frame. You need to be patient with this process. It can take awhile of dedicated shopping and latte drinking when you HAVE to stop at Starbucks because you’ve shopped so hard. The next part is super easy and you need just a few supplies. I think for the most part 90% of your creations that you want to frame will work with 3 basic materials: a frame, a piece of sticky backed felt, and 3m mounting tape. The first is to add the 3m mounting tape to the back of your piece by removing only 1 sticking backing. I like to use clear mounting tape just in case it would show, even though I’m careful it never does. You could likely use other materials to do this, this is just what I prefer and has worked the best for me. Next, trim your felt to the size of the frame. My frame was a 5×7. I took out the “fake picture” that comes with all frames, traced it on the white felt backing, and cut the shape out. Remove the glass & discard the “fake photo” from your frame. I keep the glass for future projects, but they do not go back in my frame. Now trim a heavy duty piece of card stock to your frame size. This will help add stability to your frame. Remove the backing from the felt. Place the felt onto the card stock. Do not put your frame back together, but set your frame on top of the felt and center your clay piece. Remove the remaining backing from the 3m mounting tape. Press to secure your piece onto the felt. Go make a cup of coffee and enjoy it…this will give your piece time to “grasp” the felt so it won’t come off later.